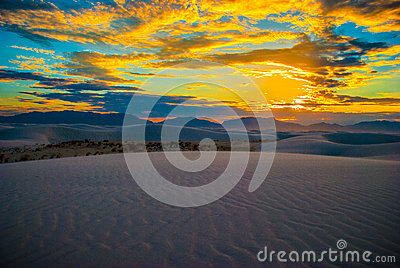 White Sand Dunes National Park New Mexico Sunset of Brilliance. the sand dunes make patterns in the wind that are amazing. the sun sets on the horizon and shines a great golden hour color all over the sky and the sand dunes are painted pink and fire red from the horizon sunset color. A landscape like non other on earth almost out of this world. Earth is so amazing and nature created all of this within so long of time.